If you are thinking about Christmas gifts at the moment here is an idea for a stocking filler. Do you know anyone with a lot on their plate who struggles to get the important things done? The Power to Get Things Done teaches you how to consistently turn good intentions into action so that you can be as successful as possible in the work you do and other things that may be important . . . whether or not you feel like filing tax forms and making follow-up calls. 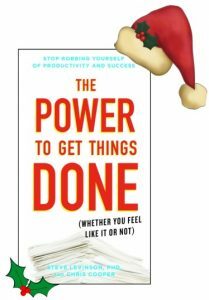 The book offers a host of practical solutions including: the correct way to think about and treat good intentions, the three key principles of following through and simple but powerful principles and strategies that will make it easy to get those important things done quickly.